Crux. © 2003 Torsten Bronger. 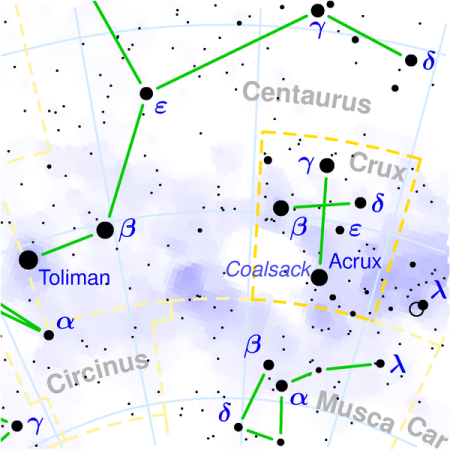 Crux (abbreviation: Cru), the Cross, is a tiny but brilliant southern constellation invisible from most of the populated northern hemisphere. Surrounded on three sides by Centaurus, with Musca to the south, it is well seen only south of the Tropic of Cancer. NGC 4463. Credit: ESO Digitised Sky Survey. 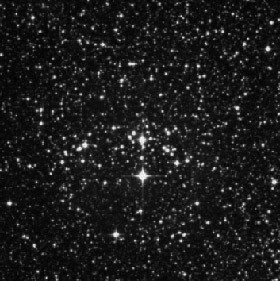 Crux contains the most famous of dark nebulae, Coalsack, and several bright open clusters, including the Jewel Box, NGC 4349 (magnitude 7.4; diameter 16'; R.A. 12h 24.5m, Dec. -61° 54'), and NGC 4463, part of which is also in Musca (magnitude 7.2; diameter 5'; R.A. 12h 30.0m, Dec. -64° 48'). See below for details of the constellation's brightest stars.